Let me take this opportunity to thank all of you for making 70000TONS OF METAL 2014, The World’s Biggest Heavy Metal Cruise once again such a success! This last year has not been an easy one, I went through a personal situation which took me out for quite a while and as a result all of you went through a lot of waiting and suspense. I will make personally sure that such a thing will not happen again! It leaves me almost speechless that the list of nations represented on board 70000TONS OF METAL keeps growing. I thought that the 55 from last your could not be topped, but here we are, having had sailors from 61 countries around the Globe made it really feel like having The United Nations Of Heavy Metal At Sea! A big Ahoy to all you Survivors from: Andorra, Argentina, Australia, Austria, Belarus, Belgium, Bolivia, Bosnia and Herzegovina, Brazil, Bulgaria, Canada, Chile, Colombia, Costa Rica, Czech Republic, Denmark, Ecuador, Estonia, Finland, France, Germany, Greece, Honduras, Hong Kong, Hungary, India, Ireland, Israel, Italy, Japan, Kuwait, Kyrgyzstan, Luxemburg, Macedonia, Mexico, New Zealand, Nicaragua, Norway, Panama, Peru, Poland, Portugal, Puerto Rico, Romania, Russia, Saudi Arabia, Serbia, Slovakia, Slovenia, South Africa, Spain, Sweden, Switzerland, The Netherlands, Trinidad and Tobago, Turkey, Ukraine, United Arab Emirates, United Kingdom, United States of America and Venezuela! A huge Thank You also goes out to all the bands on board: ATROCITY, BONFIRE, CARCASS, CRIPPER, CYNIC, DARK TRANQUILLITY, DEATH ANGEL, DEATH DTA TOURS 2014, D.R.I., FEAR FACTORY, FINNTROLL, FREEDOM CALL, GLORYHAMMER, HAGGARD, HATESPHERE, IZEGRIM, KEEP OF KALESSIN, LEAVES’ EYES, MASSACRE, NEKROGOBLIKON, NOVEMBER’S DOOM, OBITUARY, ORPHANED LAND, OVERKILL, POLTERGEIST, PUNGENT STENCH, RAVEN, RISING STORM, SATYRICON, SEPTIC FLESH, SOILWORK, SWALLOW THE SUN, SWASHBUCKLE, SYMPHONY X, TERRORIZER, THE HAUNTED, TWILIGHT OF THE GODS, UNEARTH, VICIOUS RUMORS, VICTORY, XANDRIA and last but not least Vika for her Piano Performances and David for the never ending Karaoke Nights! A big Thank You to CMM, all journalists and over all, our Media Partners: Aardschok, BW&BK: Brave Words & Bloody Knuckles, iM1 TV, Metal Hammer Germany, Metal Hammer UK, Metallian, Roadie Crew and Scream Magazine for spreading the word! Thank You to Royal Caribbean International and the entire Crew of the Majesty Of The Seas for having us on board! Thank You to Roc-Off Productions for building the biggest Open Air stage that ever sailed the Open Seas! Thank You to Clair Global for providing the Sound Equipment! Thank You to Jonas Productions for the Backline! Thank You to Cat Entertainment Systems for providing the Power Distribution on board and Thank You to Event Operations Group: The best Security Crew there is! Thank You to all the Crew, Employees and Partners of Ultimate Music Cruises Inc. for all your dedication and hard work! 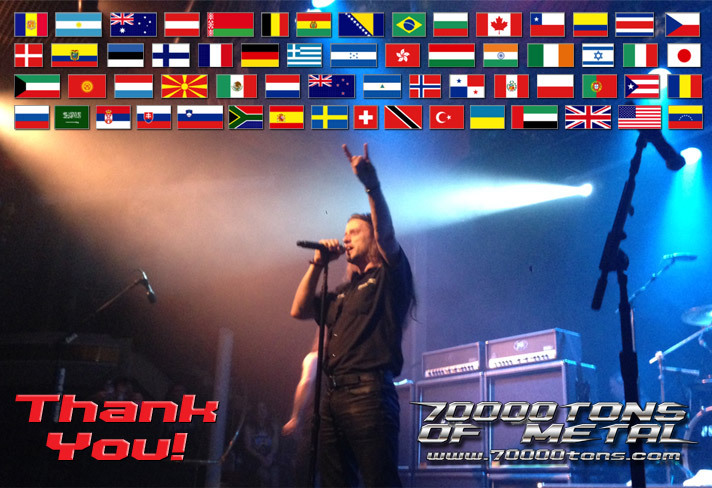 A very special Thank You to all Volunteers of 70000TONS OF METAL 2014! Without you The World’s Biggest Heavy Metal Cruise would not happen! It makes me incredibly proud to have had all of you on the same boat! I am looking forward to welcoming you all on board once again next January for round five of 70000TONS OF METAL, The World’s Biggest Heavy Metal Cruise! And for the ones that missed the news: There will be 60 Bands next year… stay tuned for more… VERY SOON! One more time: Thank You! All of You!